I recently bought a new pair of shoes. To be more exact, yesterday. 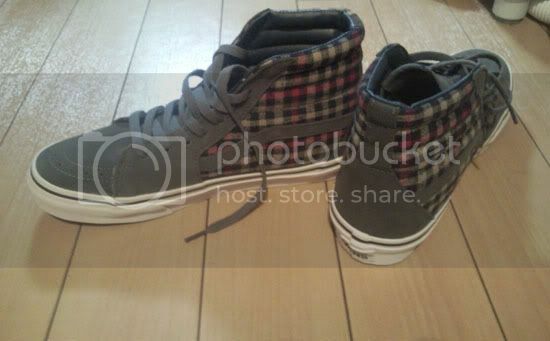 Some time last year while I was studying at Yamasa, a teacher asked me 「VANSの靴が好き？」 I replied 「いいえ。」 She was surprised. 「なんでVANSの靴履いてるの？」 Ah! She was surprised because I was wearing a pair of sneakers from VANS. Well, I don’t particularly like VANS. I mean I don’t dislike it but it just so happened that while I was shopping for a pair of shoes in Taiwan some 2 years ago, the pair of VANS shoes caught my eye and I bought them. Yesterday, while wearing my pair of pretty much torn VANS shoes from Taiwan, I was unwittingly looking to buy another pair of shoes from (no prize for guessing) VANS again. The salesgirl came up to me and said 「お兄さん、VANSが好きですね。」 I kinda resigned to that and replied 「そうみたいですね。」 And below is the pair of shoes I got. You see. I still insist I don’t like VANS because when I buy shoes, I do not particularly look for VANS shoes. In fact, I try to look for other brands but at the end of the day, VANS’ designs always manage to convince me to swipe my card. If you ask me what clothes I like, I can tell you I like this shop in Nagoya called Method. And I always go to the shop to look for new clothes. I think the thing about VANS is that while other makers produce classy shoes with sleak and cool designs, VANS tend to stand out with its unique and flashy design and colour schemes. My best friend who came over during winter last year also ended up buying 2 pairs of shoes by VANS because of their design and colour. I do not dislike VANS but I still wish to maintain that I don’t like them enough to pronounce I like them either.